Located close to infrastructure in Querétaro state, the El Escarpe is an upper level epithermal system partially covered by unconsolidated sediments and basalts. By peering through windows in the cover Sable has identified 2 extensive mineralised zones which are anticipated to continue and join under the covered areas. Elevated gold values at surface suggest a significantly mineralised system at depth. The El Escarpe Project is located 17 km west of the city of Querétaro, 90 km southeast of the city of Guanajuato, and 190 km northwest of Mexico City. The location of the El Escarpe project within Sable’s Corregidora mining concession application. 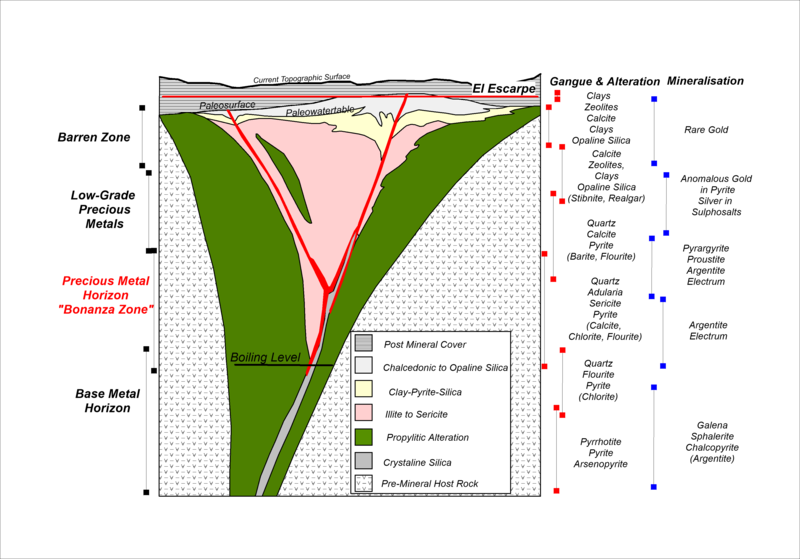 The style of mineralization at El Escarpe is a high level, volcanic-hosted, low to intermediate sulphidation epithermal system. The erosion level is at and just below the palaeo-water table, indicating that the complete system is preserved. The target is epithermal veins with high grade silver and gold. The depth of any such ore shoots at El Escarpe is unknown, but it could be as shallow as 100 m to 200 m beneath the surface. A program of detailed geological mapping and rock sampling was carried out in order to define zones of anomalous gold and trace element geochemistry, as well as areas showing textural and vein characteristics of epithermal systems. A total of 165 rock-chip samples were collected returning values of up to 1.490 g/t Au, up to 66.1 g/t Ag and anomalous As, Ba, Hg and Sb pathfinders. Values of base are very low. The geochemical signature of strongly anomalous Au, Ag, As, Ba, Hg and Sb, with low Cu, Mo, Pb and Zn is characteristic of the shallow levels of an epithermal system and defines two outcropping areas: Central and South. a 550 m long by 200 m wide zone of chalcedonic silicification with 3-5% disseminated pyrite cut by phreatic breccias. Rock-chip samples of the breccias returned values of up to 0.609 g/t Au, with anomalous Ag, Hg, As and Sb. Outcropping silicified rhyolite tuff with intense chalcedonic-opaline veinlets returned up to 0.702 g/t Au, up to 66.1 g/t Ag. a 250 m long by 150 m wide kaolinite-smectite altered zone rock of likely steam-heated origin, which is cut by several narrow chalcedonic veins striking N10-40°E. Rock-chip sampling returned values up to 1.49 g/t Au with up to 24.7 g/t Ag anomalous Hg, As and Sb pathfinders. Mineralization identified in the Central Area is anticipated to extend under thin unconsolidated cover. The southern target area is defined by a1,200 m by 100-150 m zone of narrow chalcedonic veins and abundant siliceous float at the foot of the basalt-capped scarp. Much of the float is chalcedonic vein material rather than silicified rock. Some of the chalcedonic silica is colloform banded and displays carbonate replacement texture and marcasite-rich ginguro bands. Rock-chip sampling returned values up to 1.03 g/t Au with anomalous Ag, Hg, As and Sb. A two-stage exploration program is planned for El Escarpe. 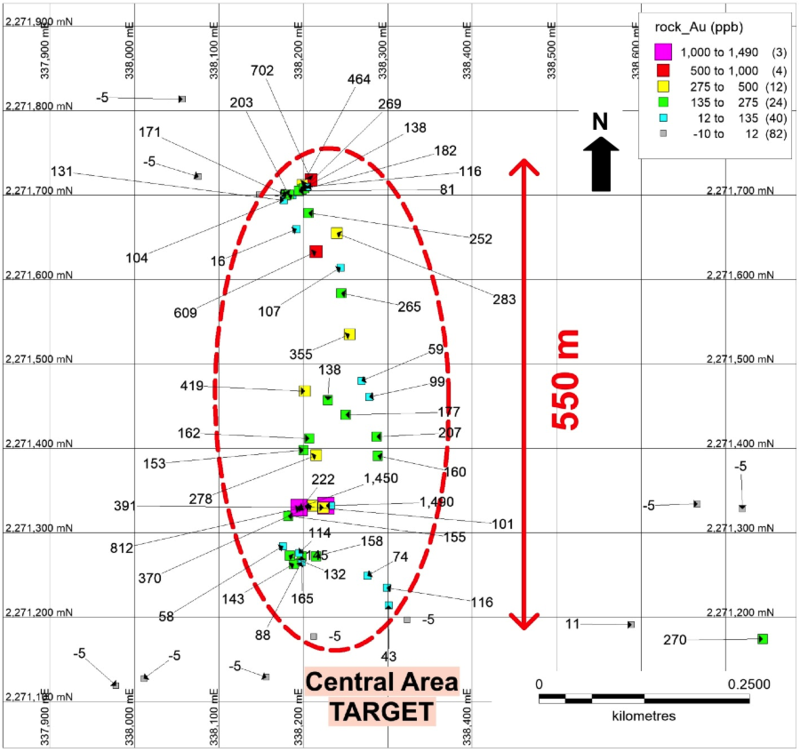 The first stage is a preliminary diamond drill program of 13 holes with depths of 250 m to 400 m totalling 3,870 m to test the Central and South Area targets. 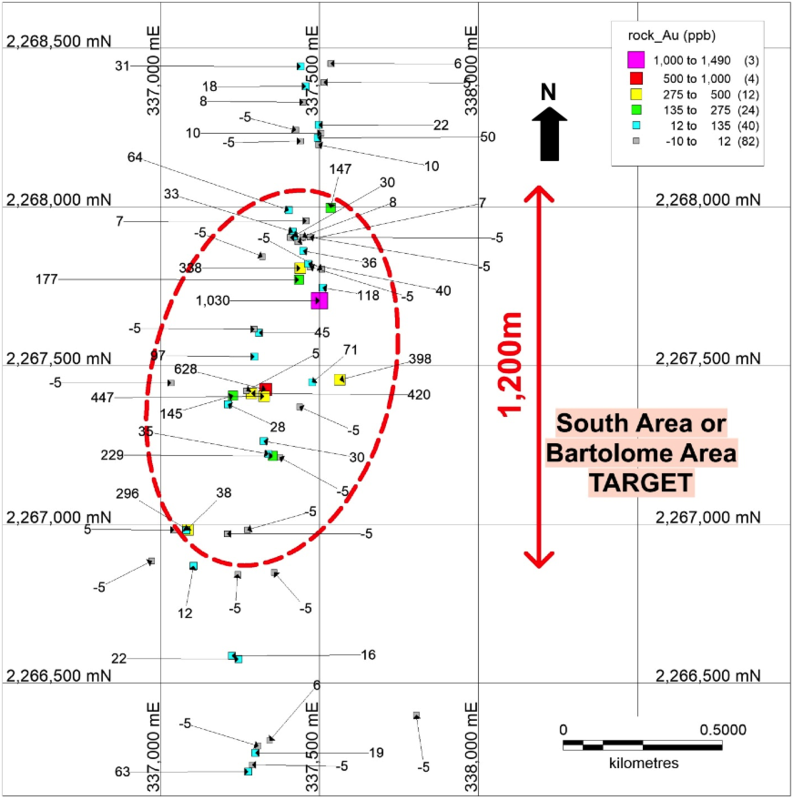 The second stage is contingent on the results of the first stage and comprises a follow up ground geophysical survey, such as a Controlled-Source Audio-Frequency Magneto Telluric (CSMAT) survey, to identify veins under cover, followed by a reverse circulation (RC) scout drilling program of 2,000 m in 8 holes to test geophysical targets. Sable Resources Ltd is a well-funded junior grassroots explorer focused on the discovery of new precious metal projects through systematic exploration in endowed terranes located in favourable, established mining jurisdictions. Sables’ main focus is developing their large portfolio of new projects to resource stage utilizing their Upper Level Epithermal Strategy. The drill projects Don Julio, Margarita, Tulox, Vinata and El Escape lead this strategy, backed by a substantial early stage project pipeline in Argentina, Mexico Peru and Canada. A world-class team doing world-class exploration.